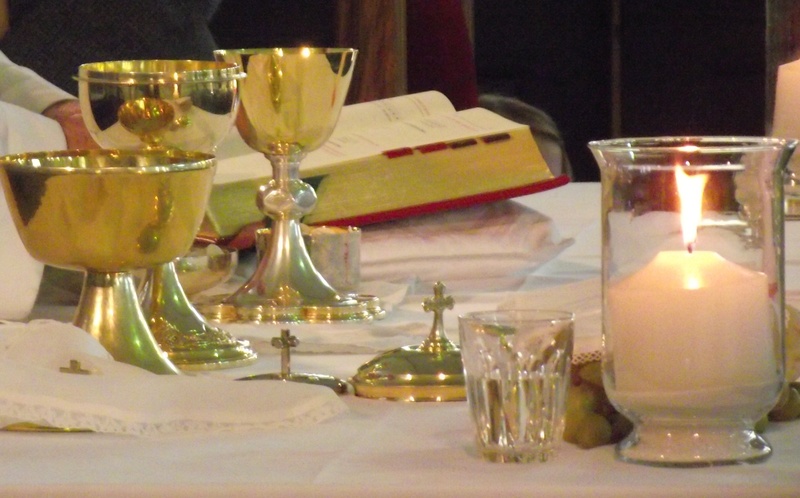 As adults perhaps our First Holy Communion is lost in the fog of distant memories, or perhaps it is cherished and still a beautiful moment that is renewed every time ‘we come to (the Lord’s) table’ to receive Jesus. It is the hope of teacher and parents – and grandparents even more so! 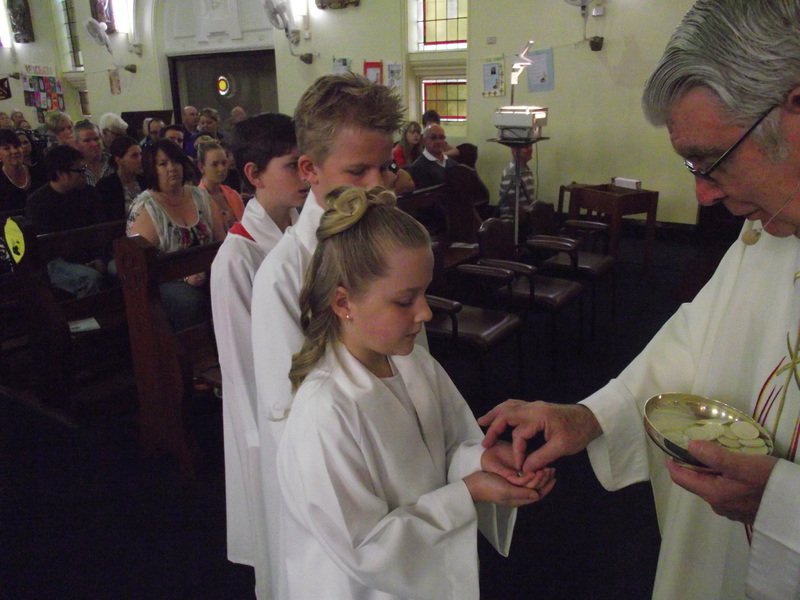 – that those who make their first Holy Communion today will grow in knowledge and understanding of the immense love that Jesus is showing them by coming to them personally in this greatest of all the Sacraments. The value that we place on a precious gift from a beloved spouse or friend depends on us – how we appreciate the love and sacrifice that lies behind the gift. Small wonder then that understanding the love of Jesus for us in the Eucharist takes time. As I grow and understand the enormity of Jesus’ dying for me after he was scourged, nailed to the cross and lingered between heaven and earth in utmost agony for three hours, I will grow to love Him in the Eucharist. The Eucharist is the fruit of Calvary and when we recognize that, we will understand more clearly and appreciate more deeply the gift of Jesus’ infinite love for us. How earnestly, then, must I treasure the opportunities to receive Holy Communion! I should long to be with Him at Calvary as the mystery is offered again in the Mass. I should long – with devout love – to receive Jesus into my body and soul and be fervent in my thanksgiving when He has come. 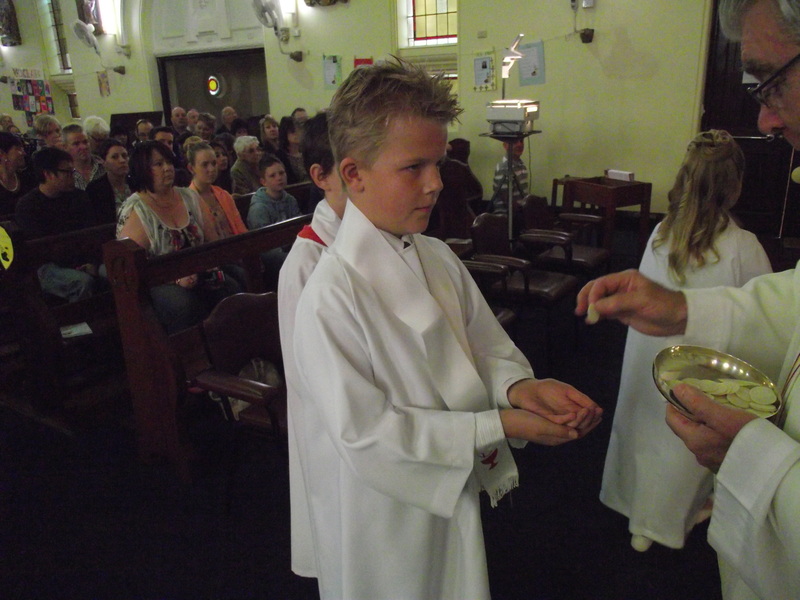 Today we pray for the First Communicants. Let them find in their parents shining examples of practical faith, as they attend Sunday Mass with regularity, fervour and joy. May the children rejoice to join their parents in approaching Jesus and emulate their devotion and dedication to God! Example, in matters of faith, is paramount because the reality is invisible. Children live in a very physical world. Yet they have vivid imaginations and can tune-in to the spiritual realities that surround us in the Mass and the Sacraments – if we help them! They are too young to grasp what St Paul recognized – that our struggles in this life are not just about the physical world. God is very merciful to us in shielding our eyes, and theirs, from the reality of the spiritual warfare raging over our immortal souls. Unless adults are strong in their faith and show constant good example, our children will have a most difficult faith life. The psalmist asks: How shall the young remain sinless? Then he answers the question: By obeying your word. But first they must know that word and ponder it in their heart. Parents and teachers are the ones to show them how to do that. Let us pray for all our families and teachers on this very special day. On FIRST COMMUNION DAY, it is fitting to have Adoration of the Blessed Sacrament to express our thanks to Jesus for the Gift of Himself in the Eucharist. 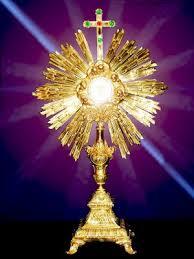 Adoration begins immediately after 9am Mass and concludes with Benediction (4.45pm) at 5.00pm. Come, adore, give thanks. On 29th August Fr Hart celebrated his 45th Ordination Anniversary. Special greetings came from Bishop Hanna with assurance of Mass and prayers. Let us join in with our prayers and best wishes. Rosaries are on-going – join at any time. Also, you can pray in your family and join the ROSARY CRUSADE in support of natural marriage. Go to RosaryCrusade.org.au to join the Crusade, or for more information. * St Mary’s Church, Sat 8.45am + Mass 9am. Patricia Seymour, Peter Howe, Rose Chandler, Ursula Bartlett, William Phibbs, Michelle Hogan, Len Sambell, Michael Scown, Patrick Whitty, Natalie Lawrence, Shirley Ash, Kevin Seymour, Joan Sandral, Imelda Gauci, Pauline Kerr, and all on our In Memoriam Board for September. NB Fr Hart annual leave 7th Sept – 19th Sept.
06th Sept 10.00am – 5.00pm ADORATION DAY – in Our Lady’s Chapel. All welcome anytime. Benediction at 4.45pm. Each week The Journey includes a variety of inputs including Sam Clear from walk4one shares his passion for Christian unity and there are brilliant stories from Fr Dave Callaghan from the Missionaries of God’s Love. Add to that some great music and interviews with people doing amazing things right around the globe and you’ve got a show that is all about faith, hope love and life. Tune into LIFE 101.9 FM or 98.5 THE LIGHT Albury Wodonga Sun 11am or go to www.jcr.org.au or www.itunes.jcr.org.au where you can listen anytime and subscribe to weekly shows by email.